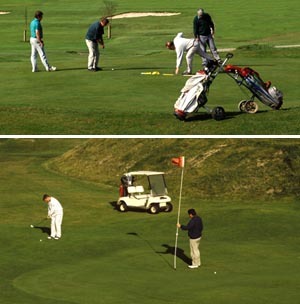 Westport and the surrounding area has several 18 and 9 hole golfcourses in spectacular surroundings. Westport Golf Club (championship) is currently ranked 43rd out of the top 100 golf courses in Ireland by Golf Digest. It has hosted prestigious tournaments, both the Ladies Home Internationals in 1989 and the Irish Amateur Close Championship on three occasions, most recently in 1997. It also hosted the Irish PGA Championship in 2002. 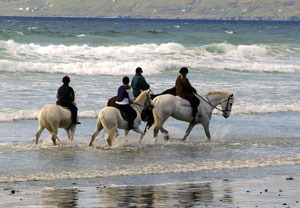 There are horse riding stables around Westport that provide lessons and rides in nature and can transport horses to beaches for experienced riders. On some beaches in the area such as Carrownisky there are racing events in the summer. At the Ballinrobe Races ( Horse Race Track- 35 mins from Westport) there are Horse racing events throughout the year. Connemara Pony and foal. The Connemara region in western Ireland, where the breed first became recognized as a distinct type, is a very harsh landscape, thus giving rise to a pony breed of hardy, strong individuals. Some believe that the Connemara developed from Scandinavian ponies that the Vikings first brought to Ireland. Another source was likely the Irish Hobby, a now-extinct breed established prior to the 13th century. Legend, however, says that galleons from the Spanish Armada ran aground in 1588, and the Andalusians on board were set loose. The Spanish horses bred with the native stock, refining the local ponies. For additional strength and stamina, Arabian blood was added in the 18th century.